Originally published in 1848, this book that takes a humorous look at feminine flirtations. It is written in a very "scientific" style possibly similar to that used in describing the behavior of wildlife. 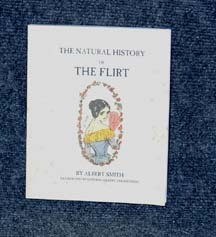 The book covers early flirtations, various locations for the flirt, and some of the items a flirt might use in conducting her activities.